"We were there to discuss the misprinted calendars the school had purchased." Disappointed that there was not going to be a 13/13/13 this year, we decided to add a month to the calendar, beginning the day after December 31, and ending the day before January 1. It's just 28 days long, like the original (seen up above), but we'll be providing the same content we always do - just given a different publication date. 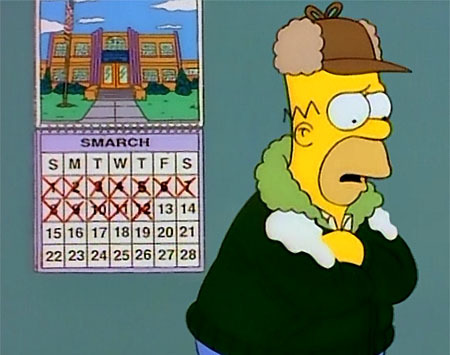 You can read all the Smarch reviews right here. We're even publishing four of our weekly Figuretoons, on the first, 8th, 15th, and 22nd - including our 250th toon, a most exciting milestone! Heck, if we could have found a way to add a month to the blog, we would have done that, too. Basically, there's an entire month of OAFEry that you may have missed, so get clicking and don't miss a minute of it!